How to be a top team. Line up in different orders. Parental advice in 99 words. Make your own word clouds. Analyze your writing with word clouds. Using word clouds for evaluation and review. The year is almost at its end. To select and implement guidelines for achieving high performance in a team. Organize participants into teams of four. If you have extra players, distribute them among the teams. Distribute copies of the Teamwork Guidelines handout. Give a different version of the handout to each member of the team. Ask the participants to individually review the 10 guidelines listed in the handout and to select three that will be the most useful for helping the team complete its mission. Announce a 5-minute time limit and start the timer. Ask team members to share and discuss the selected guidelines. Pause for about 5 minutes. At the end of this time, blow the whistle. Ask the team members to share their selected guidelines. Explain that there is some overlap among the guidelines from different handouts. So it is possible that more than one team member selected the same guideline. Ask teams to discuss their choices and select five guidelines that must be applied to achieve their mission. Distribute copies of the Teamwork Planning form. Ask the members of each team to record their five selected guidelines in the first column. (They don't have to copy the entire guideline; just the heading will be fine.) In the second column, ask the teams to write the name of a team member who will be in charge of applying this guideline. Announce a 5-minute time limit for completing the task. Ask the teams to debrief their behavior. Instruct the teams to use the selected guideline on the Teamwork Planning Form as a 5-point checklist. Ask the person responsible for each selected guideline to lead a discussion to reflect on how the team members carried out the previous tasks (of sharing their selections and filling out the Teamwork Planning Form ). Suggest that the team should rate its previous behavior on a 5-point scale where 1 indicates that the guideline was ignored (or violated) and 5 indicates that the guideline was effectively used. Announce a 5-minute time limit. Ask for improvement plans. After the team has rated its previous performance, ask the team members to brainstorm strategies for improving their scores on individual guidelines and their total score. Roam around different teams and listen to their discussion. Ask suitable questions to focus their attention. Conclude the activity. After a suitable pause, remind participants that implementing the strategies they came up with is a very important step. I dread the moment when people ask me, “What do you do?” I don't know how to explain that I am a performance technologist, or an instructional designer, or a facilitator. So I cheat by saying that I am a trainer. Here's an activity that helps you become more fluent in explaining what you do for a living. To describe the nature and significance of your job. Participants are divided into three teams. Members of each team work cooperatively to come up with the best way to explain their jobs. During the first round, two of the teams have one-on-one conversations to toot their horns. During the second round, members of the third team make individual presentations. 30-45 minutes, depending on the number of participants. Form teams. Divide participants into three teams. Label them A, B, and C.
Brief the participants. Give a pep talk about the importance of being able to explain one's job interestingly, concisely, and clearly. Ask team members to brainstorm how they should talk about their jobs and to practice their technique with each other. Announce a 5-minute time limit for this activity. Conduct one-on-one conversations. Ask participants to reorganize themselves into triads so that each triad has one member of each team. Explain that the member from Team A will act as a judge. Ask the Team C member to cover her ears while the Team B explains her job to the judge. Follow this with a similar presentation from the Team C member. After the two presentations, the judge quickly announces whose presentation was better and explains why. Conduct small-group presentations. Send all members of Team A outside the room. Explain that the members of Teams B and C will act as audience members. One by one, Team A members return to the room and explain what they do on their job. Immediately after everyone from Team A has made her presentation, the audience members vote for the best presentation. Debrief the participants. Conduct a discussion of what features made the presentations clear, concise, and interesting. Encourage personal action. Pause for a few minutes while participants individually jot down the key ideas from the activity so they can prepare a better explanation of their job to others. Bob Wiele modestly claims that he is more of an inventor of thinking tools rather than a game designer. The tools he developed are embedded into learning programs that use games to open up learning and get work done. The tools include the 4D-I online thinking and operating styles personal development system and the new Smarter Meetings program—a process mapping type of framegames that help organizations save a lot of money and teams engage their people to get more done in less time. (Check out www.smartermeetings.com .) Bob's books include Smart for Life , Smarter Meetings , and Working with Volunteer Boards . TGL: Bob, what is your specialty area? Bob: Everything I do is built off our own universal common language for connecting people and accelerating collaboration. We use a traffic light metaphor to describe three types of thinking and work: red — stop and decide for decision-making; yellow — slow down, develop understanding; green — go and get creative to generate ideas and options. The fourth dimension, white, is to appreciate and initiate for personal spirit. The four key applications of this language and the tools are in leadership development, team and meeting productivity, accelerating change (with RIP IT and our Rapid Innovation Program), and building 21st century skills for students in schools and colleges. Bob: I am a green guy—a relentless creative thinker and have always been looking for newer, better, smarter ways of learning how to learn. It all began when I started the first full time school for adult Inuit in Canada's Arctic over 40 years ago. My students were in their 20s like me, but operating at the grade school level. So I had to invent ways of how to learn stuff that worked for adults. Since I had never gone to teacher's college, I was free to figure it out as I went along. My M.Ed. helped me learn the principles and my clients taught me the ways to success. Bob: Almost as long as Thiagi. Bob: In every thing I do with people—from presentations to workshops to organizational interventions. I use the word games to mean having people do purposeful active things they were not expecting to do when they turned up. Bob: Depends on the client. The more open the client, the more we engage them in the design process and the more committed they are to games as a means to learning. The more worried the client, the less we share the process, the more we tell them to look at our client list so they know they will be in good company no matter how it goes. We want all our clients to look brilliant and get a promotion for having selected us. Bob: It's all in the framing and the naming. If I feel great, make a quick, sound business case for why we are doing this, and then toss them into it, they love it. Bye-bye PowerPoint slides, hello powerful human connections. Bob: Let me count the ways! Sleeping in and forgetting to drive 100 miles to conduct an experiential workshop with the client phoning me about his 75 people at a lodge wondering what to do. Having a Bounce sheet stuck to my rear end (no static cling?) during a workshop on smart thinking. Sensitive people not appreciating my wonderful sense of humor and getting upset. Using a competitive puzzle game with 10 teams and realizing one of the teams was stuck because they were missing a key piece. (I reframed the activity on the spot: What is the missing piece?). The toughest ones are the odd times when a game surfaces a deep personal issue that brings tears or anger flowing out. Due to the size of the group, the length of time available, and the learning purpose, it is really difficult to deal with these feelings properly in the context of the workshop experience. TGL: What advice do you give to newcomers about interactive training? Bob: Call me. I want to find great game designers to work with who can take my content and your gaming skills to co-develop and license game applications of our system to help people think better and work smarter together. If you build a great design that is well thought through from the participant's experience, clearly defined so people have a clue about why they are doing it, structured at the outset so they know what to do and it engages them right away, then let it go and trust the people to do good work and the process to get them where they need to go. When my kids used to ask, “Hey Dad, what do you really do?” I would take a page from Thiagi and pose a zen-like koan in response: “I am a learning mid-wife. I am only there for the team's heavy breathing while they birth a new solution. The baby is always theirs and never mine.” I think that's why my son Matt is now a horror movie producer. Bob: I am an applied learning kind of guy—more grounded in getting results than focusing on the learning. I think of learning as means and not as end. Do it right and you get both done. So, I often start a workshop off with asking people to identify the most pressing issues that require their best thinking. They focus on the complex issues for which there is no obvious or simple answer. Group Scoop works well here. The reality is that it is always the same type of issues that come up, no matter what the organization is. As the game designer, I have no worries about what the answer needs to be. It is clear that the participants will build solutions that work for them. We park those critical issues on a flipchart and then belt into learning the key skills in our Smarter Meetings team productivity system (green for creativity, yellow for understanding, red for decision making, and white for personal spirit). We use cards, card games, job-aids, and simulations to get people comfortable enough with the frameworks and the behaviors. Then we go back and pick one or more of the big issues they identified earlier and apply one of our smart lean process tracks to enable the teams to think through together—same page at the same time—and drive to real solutions. I like the Fish Bowl game to build skills with coaching and Detect and Connect that build skills in observation, different types of thinking, and coaching. We often finish with one of Thiagi's integration exercises such as Essence and Backstabbing to nail down the insights and to help sustain transfer. Bob: Anything that does three things: gets people moving, gets them out of their comfort zone, and connects them with other people in positive ways. Bob: Thiagi, the leader of the pack. I also have great respect for my friend and colleague, David Gouthro. The big shift is to transfer the burden of learning and to allow learning to emerge. The Executive and the Elephant by Richard Daft. An excellent self development work. Courageous Dreaming by Alberto Villoldo. Much grist for the imaginative game designer in this book. Switch by the fabulous Heath brothers. This should be required reading for all game designers. The Happiness Advantage by Shawn Achor. Seven principles of positive psychology. Bob: Games are learning on steroids. All the gens from X onwards will want to learn this way: real time, simulation, virtual. Build the right games, make sure they jolt you, and build the people skills that are the root cause of all high performing teams and leaders. Here's an energizing activity that helps members of a group get to know each other, network, and recognize what they have in common. Whistle (or some other attention-getting noise maker). Ask participants to mill around the room for about a minute. After the participants line up, blow the whistle and have them mill around the room for a minute or so. Blow the whistle again and have the participants line up according to a different criterion. Repeat the procedure as time allows. Reprinted from the October 2010 issue of Firefly News Flash by permission of the author. Sometimes our words have an impact we never intended. In this issue, we'll discover some unique ways of visualizing the impact of words beginning with this example of the problem in just 99 words. I was having a heart to heart conversation with my daughter. About to enter her teen years, I knew she would benefit from my reflections of how to survive those troubling pubescent times. As I revved up for a helpful review of my main points, I looked over in her direction. She was staring into the middle distance with glazed eyes and slouched shoulders. She'd been turned off. I'd been tuned out. Too much of a good thing had become another lecture. Less is more. I wish I'd shared my sage advice in only 99 words! A picture is worth a thousand words and a picture made completely out of words is both beautiful and worth talking about. That's the gist of this month's Discovery suggested by Jose Ochoa of Madrid, Spain. Jose was inspired by the lyrics from Dan Bern's song “Jane”, referenced in last month's issue about attention, to make a word cloud using Tagxedo ( http://www.tagxedo.com/ ). 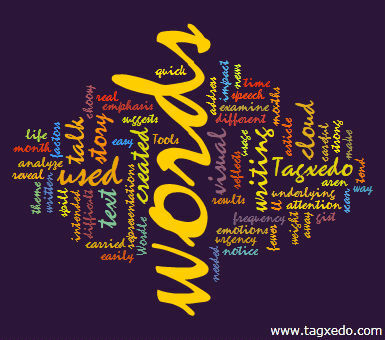 Word clouds evolved from the efforts of web developers to create a visual representation of the frequency of tag words in a document. There are many word cloud generators that are free as well as those for subscribers. Some, like Tagxedo and Wordle (which I have used in other issues of this newsletter; http://www.wordle.net/ ) offer many options for customizing the cloud as a work of art. Others like Wordsift ( http://wordsift.com/ ) take a more grammatical perspective providing links to synonyms and images for the purpose of strengthening writing skills. I have more experience with Wordle but I've become a quick convert to Tagxedo which has so many more options for customizing a word creation. One of the most interesting is the ability to import a graphic like a portrait or logo which acts as a stencil for the word cloud pattern. The Tagxedo site also has a presentation with 101 ways to use a word cloud - a great inspiration for anyone who, in addition to reading them, loves to look at words. As the 99-Word Story this month suggests, we can easily become carried away with talk. Our words, as they spill from our mouths, take on a life of their own with results we may not have intended. One way to address this might be to use fewer of them! you'll notice most of the words have the same weight. This reflects the careful attention to word usage needed to write in just 99 words. If you aren't using many words, you tend to be choosy! 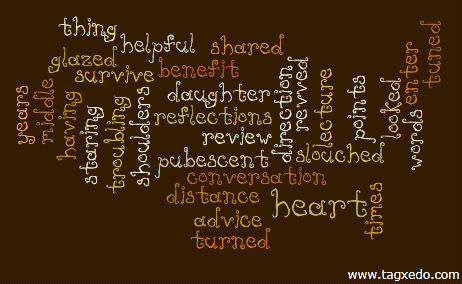 Tools like Wordle and Tagxedo make it easy to analyze the impact of written words. Visual representations of text can show frequency of words used and reveal the underlying emphasis of the text. Create a word cloud of a news article or a speech and with a quick visual scan, you get the gist of its overall theme. Or, if you're stuck without a muse, look at your writing in a completely different way. Here's a new perspective, with new inspiration, from the previous three paragraphs. The repetition of vocabulary actually makes the graphic more appealing. It's interesting to consider how words take up space. Spoken, they can fill an awkward silence or crowd out the thoughts of a careful thinker. Written, they can cover the page leaving only a slim margin while metaphorically they might also fill the mind. As a cloud, words and the spaces around them contribute to one harmonious design. For me, it's a helpful reminder to use my own words in a way that opens more space for the words and ideas of others. When that happens, I usually learn something too! If these ideas have opened some space for your thoughts, I hope you'll share what you've learned (email Brian)! Play with word clouds yourself and you will probably invent more than one way to apply them in your own setting. After seeing word clouds from the last issue of the Firefly News Flash, Jennifer van Stelle shared how she uses them for evaluation. In my own work, I was recently asked to help a church group reflect upon their accomplishments from the previous year. 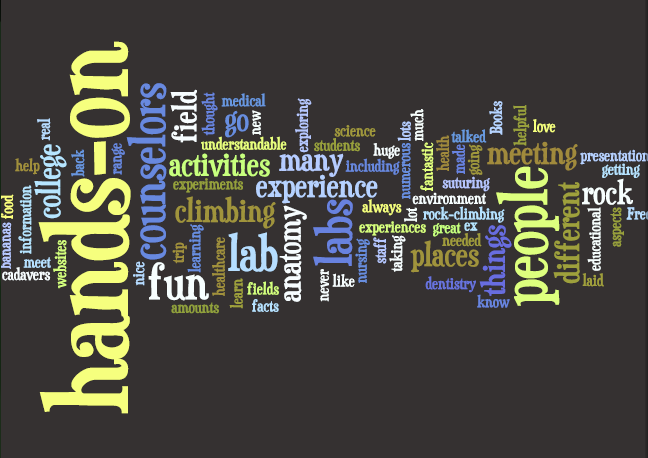 Here's how I incorporated the use of a word cloud into the day's activities. Each person was given four blank cards and asked to write what they thought were the most significant accomplishments, one per card. All the cards were collected and redistributed randomly to all participants. People were then asked to mill about the room reading each other's cards and trading when they wished to get four cards they felt were the most important achievements. Next, people organized themselves into groups of four to six and, looking at all their group's cards, they selected three as the most significant achievements for the year. Groups shared these with everyone. While people worked on the next task, making a collage to represent projects for the future, the notes about their achievements were fed into Tagxedo. In a few minutes, I was able to project a giant, colorful graphic representation of the past year on the wall. As you might guess, the effect was both dramatic and satisfying. 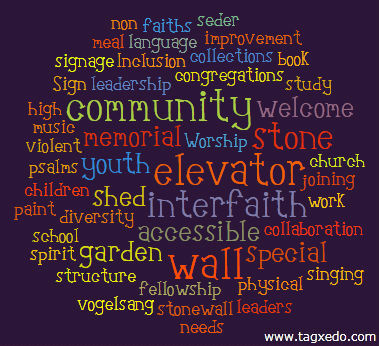 If you use word clouds in an interesting way, please share them (email Brian) and describe the results! Tracy and Thiagi will be conducting their workshops in Singapore. Here are brief descriptions of two workshops organized by our colleague Stanis Benjamin. Training professionals faced a lot of challenges in 2010: outsourcing, budget cuts, and unemployment, just to name a few. All of this may make us tempted to skip a 2010 review and go straight to planning for 2011. But that would mean skipping the opportunities and areas of growth that 2010 has also brought—such as the emergence of new social media possibilities, the increase in technology-based delivery methods, and the slow but steady increase of dollars spent in learning and development departments. As a training professional do you think the opportunities in 2010 outweighed the threats? What do you think were the top influences in the training industry in 2010? We asked some of our colleagues, and here is a partial list that they created. Clotilde: I think 2010 was an explosive year for social media in our industry. Many companies that I consult with are embracing Twitter and Web 2.0 like they were the next overhead projector. Thuany: The hiring freeze has forced my company to develop the talent of its current employees. We hope that in the long run this will result in employees who stay longer and reduce the training costs. Aaron: I've found that the unexpected benefit of cost cutting measures is that companies are going more “green”. For example, computers and lights are shut off at night, more documents are read electronically rather than printed, and water is served from pitchers instead of being served in individual water bottles. Anne: My company has increased their outsourcing and off-shoring activities. This has reduced costs, but it has also lowered employee morale and increased our company's security risk. We also asked for your thoughts about the different generations in the workplace. Here's what some of you had to say. Response 27) I have boomers, gen x and gen y. I see more variation by MBTI than variation by age. We may be different ages but we are the same species and I am not sure we have evolved that much in 60 or 70 years. I have as many gadgets as the 23 year old on my team and may know a little more than they do about the latest apps. The one variation is the use of gmail vs yahoo mail (or aol or hotmail) The younger people are the more likely they are to be on gmail. Response 25) I really notice generational differences around telecommuting/working from home. The younger generation is used to working anywhere and I notice the older generation still associating working hard with total hours spent at desk, rather than with results. There's a fluidity to the lifestyle of the younger generation that can be leveraged by employers if they can learn to embrace it. Response 11) People of different ages are often more comfortable doing things the way those of the same age do but I am not sure that it is fair to label them of a particular gen type. Personality has a lot to do with how people behave. Based on sarcastic slights from corporate types, we have identified three major objections to using improv sessions for training purposes. Using an interactive improv approach, we will explore strategies for reducing and removing these complaints. You learn how to adapt improv games to improve their instructional effectiveness. In this walk-the-talk session, you will explore and plagiarize improv strategies for improving human performance. This month's 60-minute webinar will take place at 1pm Eastern Standard Time on Tuesday, December 14, 2010. For more information, see the webinar's page at http://www.trainingmagnetwork.com/topics/show/2237 . You may need to register (and log in) before you can view the webinar description. I have learned a lot from trainers with street smarts and practical experience. But sometimes the tips from these friends lack conceptual rigor and research backing. I have learned a lot from academic friends who shared their evidence-based prescriptions on how to improve training. But sometimes the prescriptions from these friends do not directly apply to real-world corporate training. I have learned a lot from Will Thalheimer, and I still continue to learn from him. Will has a unique combination of practical experience and scholarly discipline. He reads many more juried journals than I do and he has worked with several corporations. Will has recently created a YouTube video that elegantly summarizes his model of learning. This is a very practical model and I have immediately used it to adjust the current training courses that I conduct. Take a few minutes to check out Will's Learning Landscape Model ( http://www.youtube.com/watch?v=CIYHFVXzbZk ). You will be a better trainer and training designer for it.